As soon as I hear the familiar music, I know the Holiday Season has started. I grew up with it, and after all these years, the spirited tune still brings a smile to my face. It’s hard to believe that Dr. Seuss’ “How the Grinch Stole Christmas” is celebrating 50 years. Watching it on television as part of my family’s annual holiday ritual, I always loved seeing the Whoville homes filled with colorful decorations and uniquely creative toys and furnishings. It certainly sparked my imagination. 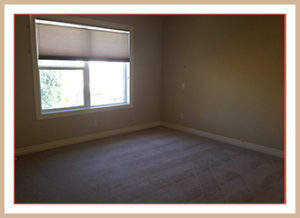 Now, as a professional home stager in Calgary, that creative spark is still in me. But it’s always balanced with the practical business and marketing sense that my clients need from my work. After all, it’s one thing to decorate with all the memorabilia that you grew up with and love. It’s another to stage in a way that quickly appeals to your buyers. And a Whoville-style staging approach wouldn’t be very practical! 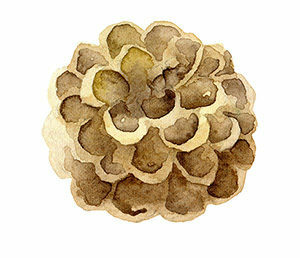 On the surface, my work is about image and presentation. It’s about shopping sprees to buy staging furniture and accessories that will help my clients benefit from a quick sale. It’s about consciously creating an ideal image of the properties that I’m working on. Skeptics would even say it’s manipulation and trickery. But underneath, my staging work is about more. It’s about people and their hopes and dreams. It’s about relationships. 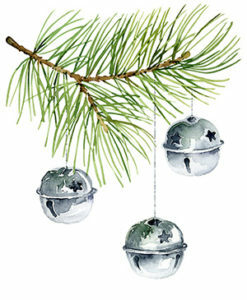 If I want to get totally sentimental about it (the holiday season does that to me), it’s about love at its core. Because, to me, homes are where love lives. And at this time of the year, when the holidays often get minimized to a focus on the pressure to buy, buy, buy, it’s important to remember that it’s also about more. To all my clients and colleagues who I have had the extreme honour and pleasure of working with over the past year (and sometimes more), I want to take this opportunity to thank you for your confidence in me and the Set Your Stage team. Know that my heart is always in my work and I do it to make a difference for you, your family… and your buyers’ families. If you will be selling a Calgary area property in 2017, I welcome the opportunity to contribute my heartfelt best to get results for you – and invite you to contact myself and/or my team. In the meantime, here’s wishing you and your loves ones thejoyof sharing the “little bit more” that Seuss so creatively reminds us of this holiday season – and beyond! All my best for 2017! Find out more about Jen Campbell Washenfelder of Set Your Stage in Calgary and contact her to schedule your free Home Staging Assessment in the New Year. Remember the good ole’ days when all it took to sell a house was to clean it up and pack your things? Well, in today’s market, buyers are looking for more. Effective home selling is about presentation. Hiring a professional home stager can be your best investment if you want to create a powerful first impression. Some properties are already beautiful. Some need a little help. 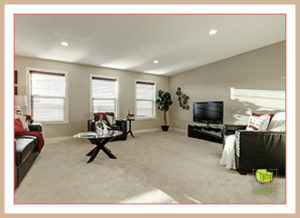 Regardless, when it’s time to sell, most properties could benefit from professional staging. That’s because home selling is about presenting an ideal lifestyle just as much as it is about checking off a list of “must-have’s”. After: The perfect place to relax and watch TV after a long day. Beyond the wish list items of number of bedrooms and bathrooms, desire for an open concept kitchen and living area, or a view, today’s buyers want to feel like they can live their ideal lifestyle and actually feel “at home” in the property. And they will know it pretty quickly. Or NOT. That’s where the expertise of a professional home stager can make THE difference in your home selling experience. With an understanding of what buyers are looking for in your particular neighbourhood and taking into consideration the features and potential problem areas of your specific property, your stager will either guide you (with a DIY option) or do the work herself (with or without renting staging furniture and accessories) to make changes that speak to your buyer. 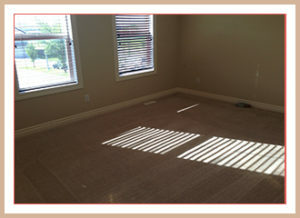 After: This master is luxurious & spacious after staging. Removing your personal items and cleaning up the grime are a given in today’s real estate market. Buyers want MORE. They want to walk in and feel like this could be home. Your home selling success relies on making the first impression that gives them what they want. So if you don’t know what that is, consult with real estate professionals who have proven results in your local area. 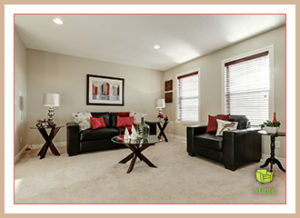 Want more of our home staging tips? Stay in touch. Follow Set Your Stage on Twitter. Colour is one of the most impactful ways to change the feel of a staged property. Freshly painted walls and some new accessories can make the world of difference to how a potential buyer perceives your listing. Confused about how to choose a staging colour combination? Look to nature for inspiration. 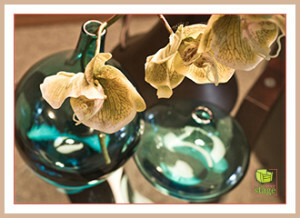 After Staging: The green orchids look stunning in the glass blue vases. A staging colour combination that does not make sense can create a jarring feeling for potential buyers as they view your listing. Instead, you want them to feel at ease as they move from room to room. Colour can create that sense of flow. Starting with a piece of art or a throw pillow that represents the feeling that you believe buyers want to have in their new home, you can pull colour combinations together that unify the rooms. And you can also look to nature. 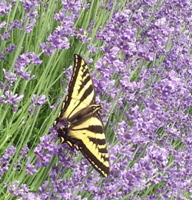 Take this butterfly wing I pinned to the Set Your Stage “Nature” board for example. Warm neutrals cover most of the wing. Then a hint of blue adds a pop to attract your eye. This is the same approach you can use when staging your house or condo. After: This open concept living room is the perfect space for entertaining or relaxing. Click like if you love the 17 foot high ceilings! 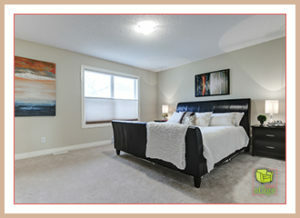 You can see this staging colour combination at play in a staging consultation we provided in Evanston Calgary. The majority of the room is one of the warm neutral colours (like in the butterfly wing). Then there’s a pop of blue in the cushion, accessories, and artwork to add life. This staging colour combination creates a sense of comfort and peacefulness while at the same time feeling vibrant and alive. It does not feel like a boring room that potential buyers will forget about as soon as they move on to view their next listing. 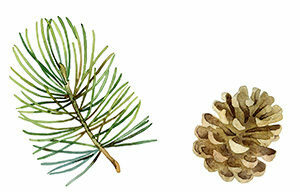 If it’s time to sell, look to nature for a staging colour combination that appeals to potential buyers. OR get some help from a professional home stager with experience staging properties in your neighbourhood. 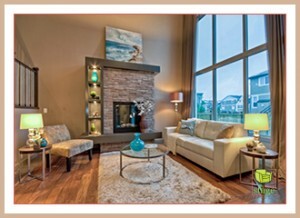 As a Calgary home stager, I write a lot about staging the inside of your property to sell. But the outside matters too. When you stage your yard, you invite buyers to imagine their lifestyle in the entire space, both inside and out. If you already a flower or vegetable garden, make it a feature. After: Enjoy the beautiful views of Senator Burns Gardens from your generous sized patio with ring side seats to all the famous Riley Park events. Having lived in a Sunnyside condo for years and now moving into a house in Deer Run, Calgary, one of the things I’m super excited about is having a backyard where I can plant a garden. I look forward to eating my own organically grown veggies and creating a nurturing and welcoming space for people and creatures alike, including birds, bees, butterflies, frogs, and dragonflies. That said, I am also a busy professional who doesn’t want to spend all my free time creating and maintaining my outdoor space. I want to enjoy it! Your potential buyer might be in a similar situation. When you stage your yard, it’s important to understand your potential buyer’s ideal lifestyle. Potential buyers may not love the idea of gardening so it’s best to keep everything simple. However, if you’re not planning on selling and want to set-up a raised garden box, check out these flexible design solutions that both looks tidy AND is easy to maintain. For selling, stage your yard with flexibility, low maintenance, and tidiness in mind. 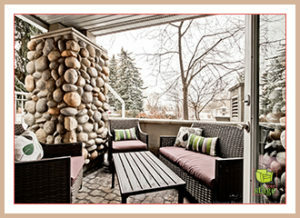 Make it appealing for potential buyers who would love to spend time in their own backyard oasis. You are currently browsing the archives for the About Jennifer Campbell category.